fabulous card, Joan and have those stamps, the die and the Nuvo drops also - think i'll just CASE it - love love! This is awesome! Very modern looking to my eye and I am usually more of a traditionalist but I really LOVE this! Now I will have to see what stamps I have on hand to create something similar. Holy cow, that white paint is fantastic! 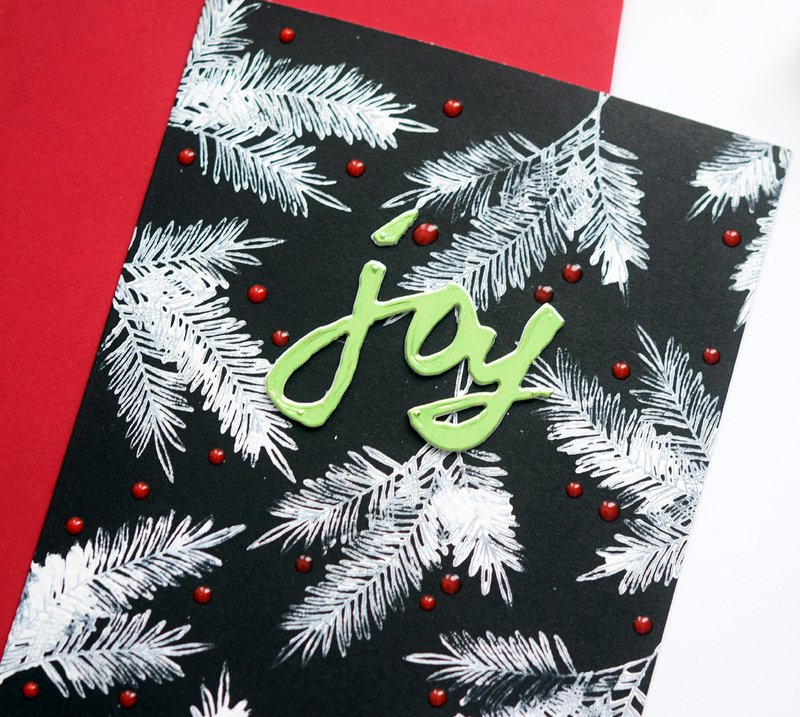 I developed a love of black on Christmas cards recently, and this one with the white branches and red Nuvo drops and the pop of lime green is gorgeous! I love it! Thanks for the tips on the white paint. Beautiful card, of course! I, too, have been SO frustrated by not being able to achieve a clean, crisp, solid white image on dark cardstock, and it's one of my favorite styles. And I can't emboss successfully to save my life. I'll be sure to try the white gouache paint. Thank you for the update on your surgery; I was thinking back to August and wondered what the outcome was. (Don't share that last sentence with Susan R.; she'd find the grammatical mistake immediately.) So enjoy your posts and look forward to many more years of them.